On 9 June 2014, a RIPE NCC Regional Meeting took place in Almaty, Kazakhstan with a total of 105 attendees. This was the first regional meeting to be held in Eurasia. It was attended both by RIPE NCC members and the wider Internet community from Kazakhstan and the surrounding region. There was no attendance fee for the meeting. 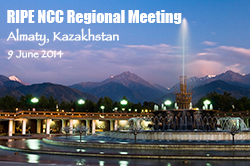 This RIPE NCC Regional Meeting took place at the Rahat Palace Hotel on 9 June 2014 in Almaty, Kazakhstan. The Deploying IPv6 Training Course was held at the meeting venue from 10-12 June. The course was free of charge.